The London Stock Exchange, established in 1801, is the largest European exchange and fourth largest stock exchange in the world. The LSE is home to some of the largest companies in the world with over 1,300 companies representing well over 60 nations. In the Fall of 2011, LSE and DataStor, a UK-based scanning and document capture provider, implemented ImageRamp operating on a Fujitsu N1800 Network Attached Scanner. The Fujitsu ScanSnap is a touchscreen-enabled scanner incorporating the ImageRamp software to simplify the capture needs for the LSE. ImageRamp was deployed in the finance department of the LSE to facilitate the automated processing of credit notes. The business drivers for the implementation were to enable credit notes to be available for search and retrieval by every authorized member of the finance team via their ECM application and to provide better compliance. Prior to scanning a credit note, barcode separator sheets are inserted into a batch of credit notes to be scanned. 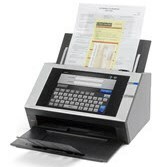 The documents are then scanned at 300 dpi, auto rotated and barcode separators detected and removed. Every 15 minutes the credit notes are uploaded to Datatstor. The credit notes are then OCR'd to allow intelligent data extraction of various items of unstructured information such as account codes and invoice/credit note numbers. This data is used as metadata to index the files before loading them into the ECM system. File naming using the barcode data provided the index metadata for the ImageSilo cloud databases. More on Barcode File Naming.